Of all of the components that a car requires to run, the tires are the most visibly important. Without a full set of decent tires, a car cannot drive safely, if at all. Most car owners worry primarily about getting flat tires, but that isn’t the only thing that can go wrong. The grooves on the part of the tires that touch the ground are called the treads. The tread on the tire creates traction, providing the tire with a better grip on the ground below. The grooves in the tire tread push water, snow and other things out of the tire’s way. Over time, tires lose their tread due to the constant friction and pressure of rolling on the road. As tires lose tread, the tires become susceptible to hydroplaning on wet surfaces. Sufficient tire tread is essential to the longevity of the car and the safety of all its passengers. The experts at CarRegistrationAdvisors.org strongly recommend changing tires every few years to maintain a safe amount of tire tread. Here are two reasons why it is dangerous to drive on tires with worn-out treads. The most obvious and common risk of driving on tires with worn treads is hydroplaning. In wet weather, tires need more traction to be able to grip the slippery road. When a car has a safe amount of tread, it pushes moisture out of its way. 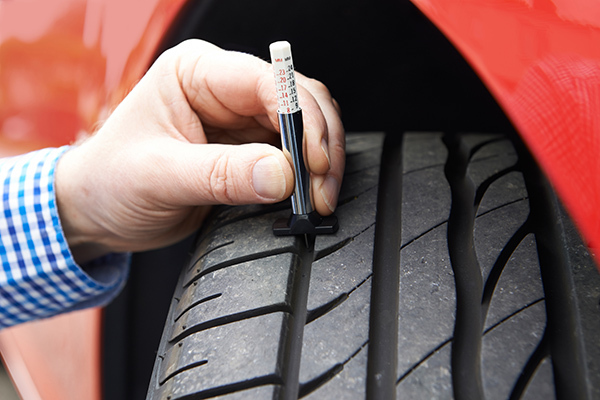 But when a tire has little or no tread, which is sometimes referred to as “bald” tires, the elements just pass under the tires. The risk of hydroplaning rises significantly when the car is moving at a high speed. When a car is driving fast over water or snow, it can glide over it. This becomes dangerous when the driver needs to stop or turn. Even in dry weather, tires with insufficient tread pose a serious risk to the driver’s safety. In all kinds of weather, bald tires are associated with drivers experiencing a delay when braking. According to the experts at CarRegistrationAdvisors.org, bald tires have little-to-no-traction, and the tires cannot grip the ground quickly enough to brake in time. The delay can cause the car to drive several feet before braking. For drivers living in frequently snowy areas, the team at CarRegistrationAdvisors.org suggests that it may be a fruitful investment to buy tires with special winter treads. The tread patterns of winter tires are different from that of standard tires. Winter tires have many razor-thin grooves that help to push dense snow out of the tires’ path. At the very end of a tire’s life, the tread may eventually peel away or split from the rest of the tire. When tread separates from the body of a tire, it means that there was no more tread to be worn away. Tread separation means that the tire is completely destroyed and cannot be used. It is common for tread separation to happen while the car is driving. Experiencing tread separation while driving can be incredibly dangerous, because it is easy for the driver to lose control of the vehicle. The experts at CarRegistrationAdvisors.org strongly recommend changing a bald tire before it gets to the point of separation. Tire separation may also cause tire blowouts, which means that the tire has exploded. Tire blowouts and tread separations are likely to happen when driving and is a serious safety hazard for all car passengers.